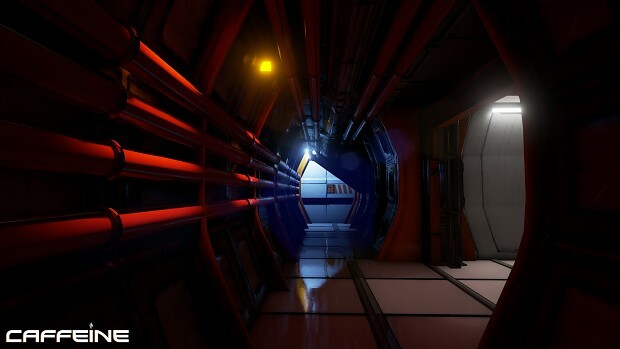 This is a Pre-Release demo of Caffeine running in Unreal Engine 3! Please Note: there are a few bugs and the game uses a lot of computer resources due to large texture file sizes! The demo is a short sample of the atmosphere and game play that I plan to include in the full version of Caffeine which will utilize Unreal Engine 4. During the demo use "E" to interact with switches and to play the tape recorder in the office area. There was a demo and I didn't know!!!!!!!!! Ive been waiting for this! Downloading now! As a fellow solo IndieDB'er I wanted to give you some thorough feedback on your game! All in all, I thought it was very promising. Good usage of modular assets, pleasing post-effects, level designing, and reflections. It does seem to be just a series of jump-scares thus far (I assume it'll be a bit more in-depth later on), so I don't wish to critique that in its current state. It did startle me plenty of times so A+ on the scare factor! I had a few optimization/performance nitpicks, including the huge amount of water plane that I saw jutting way away from the level when I ghost-commanded around the water area of the map. Another issue is the total lack of player hud and default UDK footstep sounds, which are the first things I replaced when I started :P I also had some issues with character movements: for example when you jump and move forward you practically fly! And F seems to stick the character for some odd reason. An important note: I DID max out the game settings, but I have a very powerful gaming setup (GTX 780, i7-3770, 8gb ram) and encountered obnoxious frame drops and such especially from the reflections which I found disappointing . Try experimenting with reflection settings/resolution as well as streaming in maps if you haven't already. I have spent a hell of a lot of time trying to segment and optimize my bunker level, and it makes a very noticeable impact on performance! . Despite the above issues, Really nice atmosphere and designing. I actually really respect the amount of work you have done in such a short time: I have classes/duties that prevent me from working my desired amount on a daily basis. Anywho, If you'd be so kind, I'd love to chat/email about your game as well as ask some general questions regarding workflow and modular asset creation. Thanks, and I hope you do well on your fundraising campaign! First thing I noticed was the lack of resolution options. My native is 1680x1050 which was not available. As others have said performance is appalling bad. I found the movement controls to be very unnatural and awkward (Jumping especially). Also if you don't want the player to sprint don't include it, that 'brisk walking' pace was rather frustrating. The transition between walking and 'sprinting' was also to needs acceleration it was to abrupt. There also seem to be a few clipping issues as I got stuck several times. There needs to be some sort of obvious distinction between doors that are locked and those that aren't. Or at least some audio feed back for when you approach a locked door that indicates its in that state. The switch objects could use a sound to indicate they were actually pressed/pulled. Darkness is overused, I don't mind a few pitch black areas but this was a bit much. I low intensity personal light source would be a nice (perhaps a glowstick or lighter). I couldn't even see the tape recorder as it was so dark only it's seemly glowing play button. The players height seemed oddly short, with benches being at eye-level and all. Not sure if this was intentional. The sound effects accompanying the 'scares' was unnecessary in my opinion and detracted from the experience. Overall has potential, looking forward to seeing future progress. Thanks for the feedback :) I can't believe I forgot about 1680, I used to have that res and always got frustrated when it wasn't included! I will guarantee in the final game there will be a much better system settings menu! please ignore me....disabling 3d fixed the problem. ahh right, its all good :) thanks for trying the demo! what can I do `?